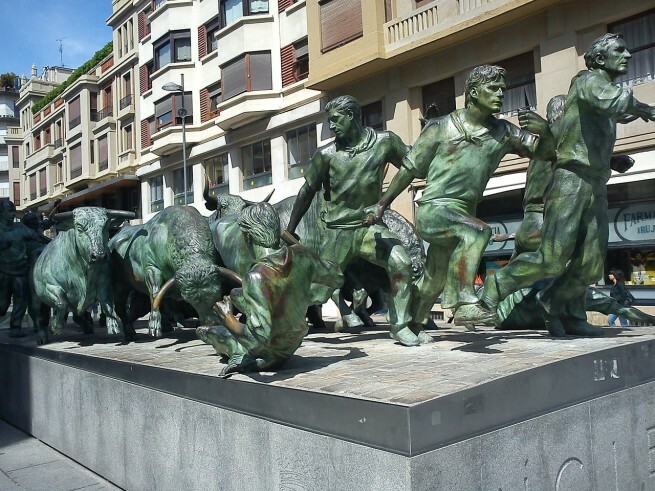 Fly private to Pamplona, Spain, the prodigal home of San Fermin Festival’s most famous event. El Correo de Los Toros, known in English as The Running of the Bulls, pits man against beast in a daily three-minute run through the meandering streets of this historic city. At 12:00 pm a firework is shot into the sky, and the bulls are chased out of the choral and right into the city where thousands of Spaniards and visitors wait for their chance to run with them to their destination. Runners dress up in garb similar to what matador’s wear in the ring, carry flags, and pit themselves against the huge steers. The run has developed year after year into something akin to a spectator sport. Runners often run directly in front of the bulls at breakneck speeds to test both their athleticism and their mettle. You’ll see men get as close as they dare, touching the animals as they run next to them, and looking backwards as they run in front to ensure that they aren’t trampled. Of course, this often leads to very serious injuries and deaths as runners cross the line and end up gored by these untamed and very dangerous animals. The unregulated and raw adventure associated with this event is what draws people from all over the world, and the other San Fermin Festival activities keep visitors plenty busy throughout the night and the rest of the week. Now the Spanish aren’t arbitrarily running screaming through the streets next to dangerous animals; there is a significant historical and cultural significance to this custom. The San Fermin festival gained global notoriety after the famously positive descriptions in Earnest Hemingway’s The Sun Also Rises turned people on to the celebration. An outspoken advocate of the celebration, Hemingway described the week as a riotous 24-hour party with decadent breakfasts, long lunches, and bed-hopping nights. But this festival boasts a long history spanning back well before the well-known author popularized it. Dating back to the early 1500’s, the Fiesta de San Fermin is dedicated to Pamplona’s deputy Saint Fermin. The running of the bulls comes from early on. The shepherds would walk the animals from one end of town to the other, and would run them through the residential district as to not wake the residents with their loud mooing. This 3-minute stretch led to the famous festival we know today. Other early practices that persist today include parades and group singing. The parade of the Kilikis and the Zaldikos, the Giants and the Big Heads, still uses the figures created over 150 years ago, and the whole town still sings Pobre de Mi on the last day of the celebration. While San Fermin still honors its rich history as a persisting celebration, it is better known today for danger, adventure, and partying. However, private jet travelers need not party like Hemingway in order to enjoy this iconic festival. Spectating on this unique event is far more popular than actually running with the bulls. One can see why; common sense usually promotes not getting gored, but that doesn’t mean that you can’t watch others do it. Fly private to Spain for San Fermin, and run with the bulls, or live vicariously through those that do. Either way, a private flight is the best way to get there. Bring your friends and start your festival early with in-flight catering including gourmet food and your choice of liquor. Whatever you want to eat or drink during your private flight, Jet Charter Europe can arrange it to be waiting and ready for you to enjoy the moment you walk into your private jet. A private flight to Spain is always a good idea, but Pamplona makes it a top priority destination during this summer week in July. The historic area of Pamplona is well equipped to handle the influx of visitors during this week. Several airports stand ready to receive private flights and accommodate the comfort and privacy needs of private jet travelers. Book a private flight to (PNA) Pamplona Airport for the most conveniently located landing strip 3 miles outside of the city proper. Or head to (RJL) Logrono-Agoncillo Airport for a more private option and enjoy a bit of a road trip on your way to the Pamplona. Find the same luxury found in your private jet in the hotels in and around the city. If you’re going specifically for the San Fermin festival, the luxuriously modern Alma Pamplona Hotel offers front row seats right in the heart of the festival. Everything is within walking distance when staying at this centrally located eden. Wherever you decide to stay during your luxurious San Fermin getaway, Jet Charter Europe can arrange the private flight itinerary to meet your every need. Available 24 hours a day and 7 days a week, our jet charter brokers are available to arrange flights with as little as 4 hours’ notice. Whether you need a multi-leg flight with in-flight catering, luxury ground transportation, or private helicopter lifts, our jet charter brokers can arrange it all. Your fun-filled Spanish vacation is important to you, so it’s important to us as well. However, our top priority is always your safety. As one of the few Wyvern certified jet charter brokers, every flight is subject to our stringent guidelines regarding aircraft maintenance and pilot experience. So know that Jet Charter Europe will be side by side with you throughout the booking process. Start planning your trip to the San Fermin Festival now, and give us a call to request a quote or to book your private chartered flight to Pamplona, Spain. Request a Quote or give us a call at 1-888-987-5387 to speak with one of our Jet Charter Europe agents to arrange your private flight to Pamplona, Spain for the Running of the Bulls/San Fermin Festival this July!